Moon Cycle Nutrition provides holistic nutritional guidance and ayurveda consultations based on ancient wisdom and modern science. 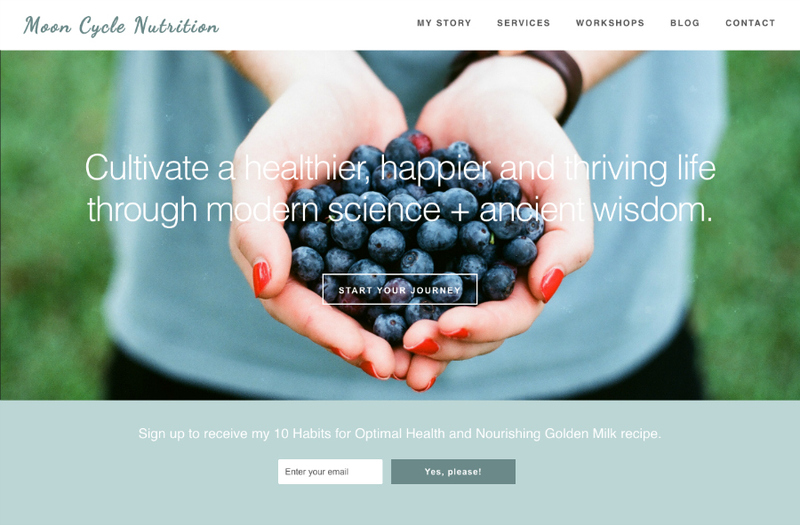 Nimisha, founder of Moon Cycle Nutrition, reached out to me wanting an elegant and feminine design for her holistic nutrition and ayurveda consulting business, Moon Cycle Nutrition. In addition, she needed a number of features to make it easier for her clients to book an appointment online and find services quickly. I created a minimalist-style site for her with a clean layout to focus attention on her services. Imagery, fonts and a soft color palette were used to create the feminine, elegant look. Additional features like online appointment booking, upcoming events and lead capture forms were built in to the website. A priority for Nimisha’s website was an easy and efficient way for her clients to book appointments online so that email exchanges back and forth were reduced. 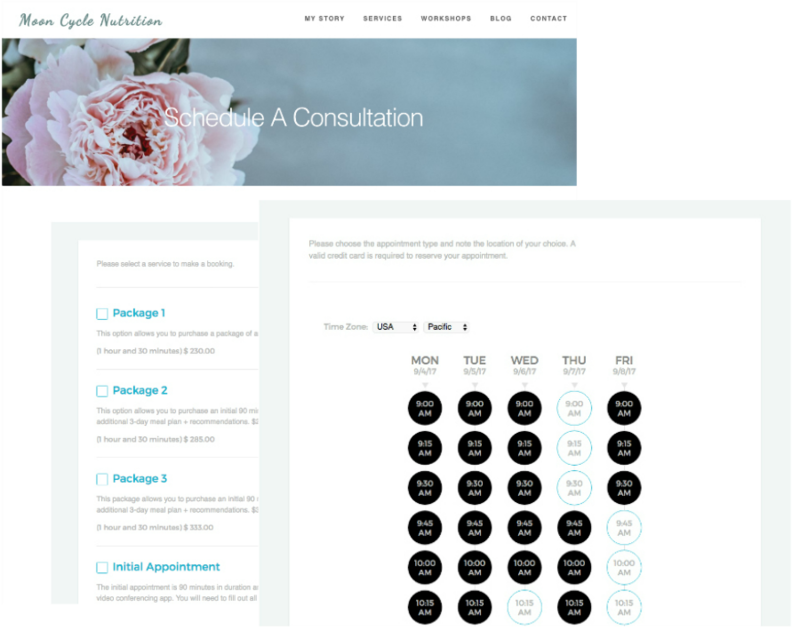 An appointment scheduling and booking system was integrated directly into her site. Clients can now choose their best time according to Nimisha’s pre-set availability. And, everyone saves time. Event management was another site feature requirement. 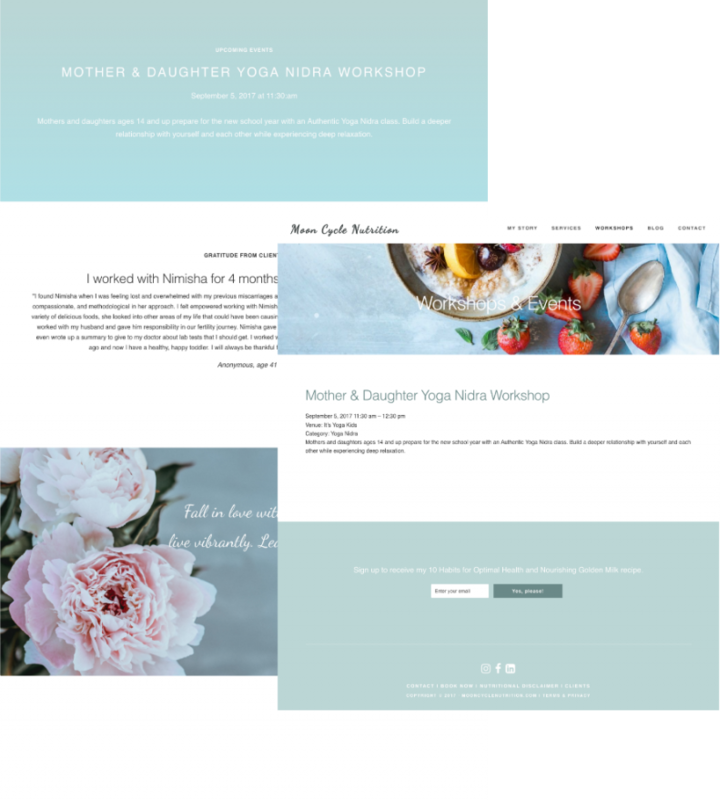 Nimisha wanted an easy way to add her yoga nidra workshops and other events to her site, including displaying these events on the homepage. I created a custom events page and added functionality so that events populate throughout her site automatically when she creates or updates an event. Not needing to enter the same event twice saves lots of time and keeps the messaging consistent.